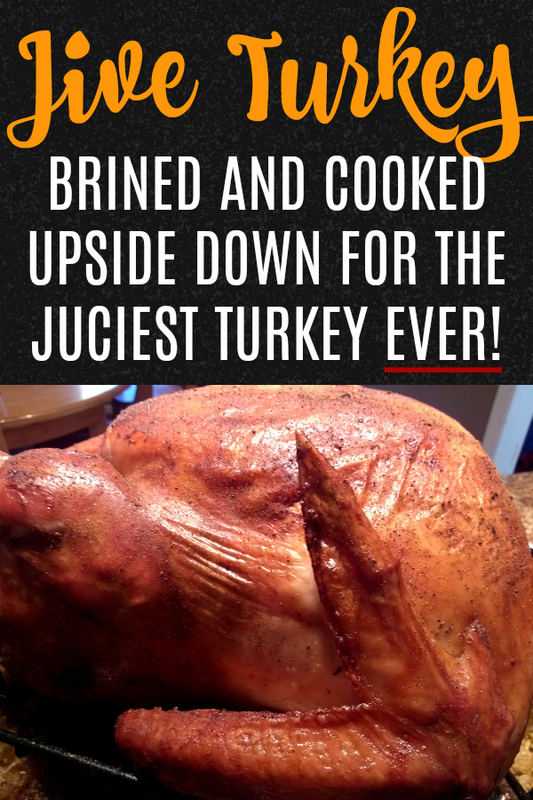 A brined and slow-roasted turkey seasoned with a special blend of herbs and spices cooked UPSIDE DOWN for the juiciest turkey ever! My family has cooked turkey six ways from Sunday. We've baked it, fried it and smoked it. You name it, we've probably cooked it that way. And I never really loved any of it. Then years ago my mom discovered a recipe by Pam Anderson in the cookbook The Perfect Recipe that totally turned my turkey world upside-down. Pam experimented with cooking techniques and came up with the idea of cooking the turkey upside down and on its sides – rotating the bird throughout the cooking process. Pam also introduced us to brining. Over the years I've added and omitted a few steps and ingredients and come up with what I think is the best turkey recipe EVER. There are two secrets to this recipe: the brine and the cooking process. When you brine any cut of meat, the proteins soak up the salt water and retain it throughout the cooking process. This is one of the steps that makes the bird so juicy. I decided that as long as the salt water was going to serve as a flavor train to Turkey Town, we might as well add other flavors to the process which is why I make the concentrated vegetable/herb stock to add to the brine. The second secret is cooking the turkey upside-down in the beginning. This helps to ensure the breast meat doesn't dry out because the juices and fats from the dark meat will seep down into the breast-side and this helps to protect the breast-side from the arid oven climate during part of the cooking process. You're going to look at the length of this recipe and think, DANG this is involved! But it's really not. Read the entire recipe through so there are no surprises (start the brine the day before). And seriously, you're prolly only going to cook this once a year so why not go all out! 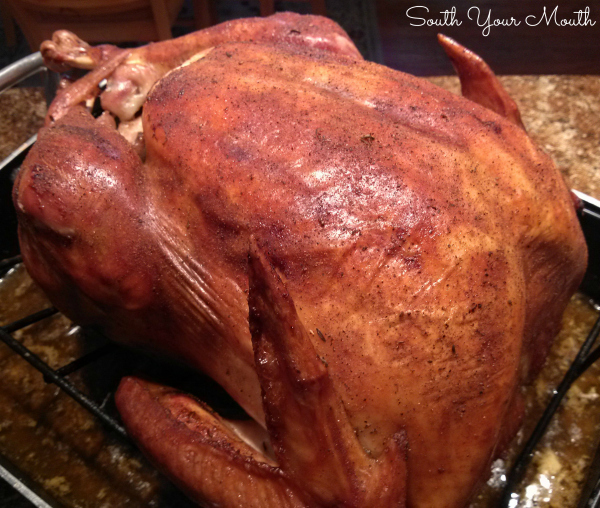 Be sure to serve this with some homemade Cranberry Sauce too! Bring two quarts of water to a boil in a large saucepan. Add onions, carrots and celery then reduce heat to medium low, cover and simmer for one hour. Remove from heat and add thyme and rosemary. Cover and cool to room temperature. Once cool, add to a large stock pot, clean bucket or small cooler. Add remaining water (6 quarts), salt and sugar to vegetable stock and stir to dissolve sugar. Add turkey (neck and giblets removed from cavity and set aside for gravy if desired) to the brine, cover and refrigerate overnight (at least 12 hours or up to 24 hours). If the weather is cool enough, I just set mine on the screened porch overnight. *If you’re cooking a larger turkey and need more brine, use 1/2 cup salt and 1/4 cup sugar for every gallon of water needed to cover the turkey. Also, cooking times are listed below for smaller or larger birds. Remove the turkey from the brine and rinse inside and out. Tie the legs together with kitchen string (or tuck them back into the skin as some manufacturers prep them). Place the turkey BREAST-SIDE DOWN on a roasting rack (if you don’t have a roasting rack, rough-chop onions, celery and carrots and place on the bottom of the pan so that the turkey can rest on the veggies and not on the bottom of the pan). Season the turkey with about 1/2 of the Jive Turkey Seasoning. Add just enough water to the pan to cover the bottom. Bake, uncovered, at 325 degrees for 1 1/2 hours, basting twice. Remove the pan from the oven. Using barbeque gloves or clean oven mitts, flip the turkey so that it is setting BREAST-SIDE UP in the pan. Baste with pan juices and season with remaining Jive Turkey Seasoning. Return the pan to the oven and continue cooking for an additional 2.5 - 3 hours or until a meat thermometer registers 165 degrees and skin is golden brown, basting every 30 minutes. Remove the pan from oven. Remove turkey from pan (reserving pan juices for gravy), cover loosely with aluminum foil and allow the turkey to rest for 20 minutes before carving. This looks sooo good. This is the turkey I will make this year. Thank You! I hope you do! I've yet to find anyone that didn't love it! I don't think I'm even going to wait for Thanksgiving. can this be done for just the turkey breast? I live in North Carolina, after being born and raised in Michigan. One year, a woman I knew cooked her turkey upside down. I thought that was just crazy. But, it was the best Turkey I have had. I am definitely going to try your recipe this year. Love your recipes! 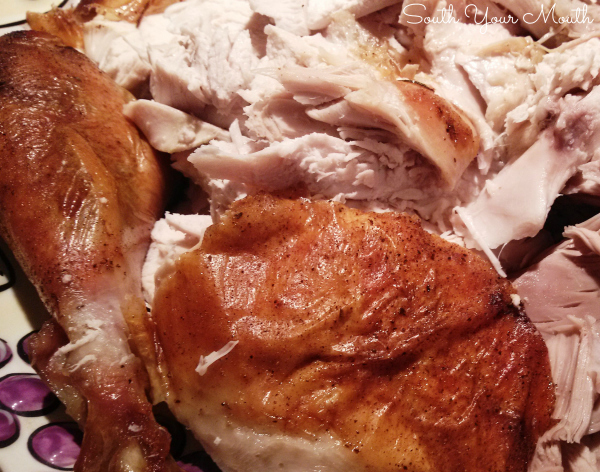 I always brine my turkey and it is really moist and tasty. I am going to try the upside method this year to hopefully make it even better. Love, love, love this site!!! Do you have to make any adjustments to the salt if your turkey is prebasted? Hi! If I Brine, can I still use the turkey injector throughout the cooking process? Thanks! Also... what is cool enough to leave it outside overnight in a cooler? Thanks again. I think things might get too salty if you brine and inject but I guess it depends what you're injecting it with. The temperature needs to be 40F or below to safely store the turkey outside. Good luck! Mandy, Why do you suppose we need to add the salt and sugar, after the vegetable broth reaches room temperature? It seems like the sugar would dissolve more easily in warm broth. I know you are a brining genius, I'm just wondering what the idea is behind it. I also wanted to ask if you can make the brine a day or 2 ahead of time, store it in the refrigerator, perhaps minus the salt and sugar, then add those 2 ingredients later and begin the brining process? I defer to your culinary brilliance. You can certainly add them in while it's warm! And yes, you can prepare the brine ahead of time! Wow! Thank you! I'm so glad y'all enjoyed it! Aside from the book I'm currently reading which is proving to be quite the find (Eleanor Oliphant is Completely Fine), your commentary is hands-down, the best thing I've read all month! Maybe in the last six months! Thank you for your service in the fight to save Thanksgiving dinner!!! 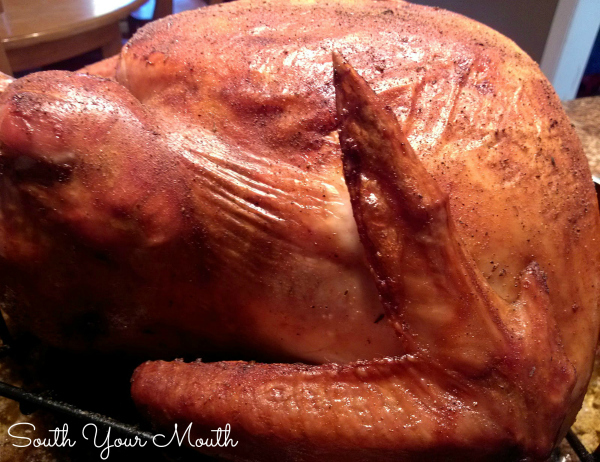 Does brining the turkey make the drippings too salty for gravy? Not quite but you won't need to add any salt, that's for sure. I keep a carton of turkey or chicken broth on-hand in case I need to cut it a little. Do I strain the brine before putting the turkey in? Hi. Would it harm the turkey if I leave it in the brine more than 24 hours? I think it would be fine but I wouldn't go longer than 36 hours.